I walked through the Viking Triangle in Waterford City on the New Year’s morning and came across a Christmas Tree graveyard where I took this photograph. 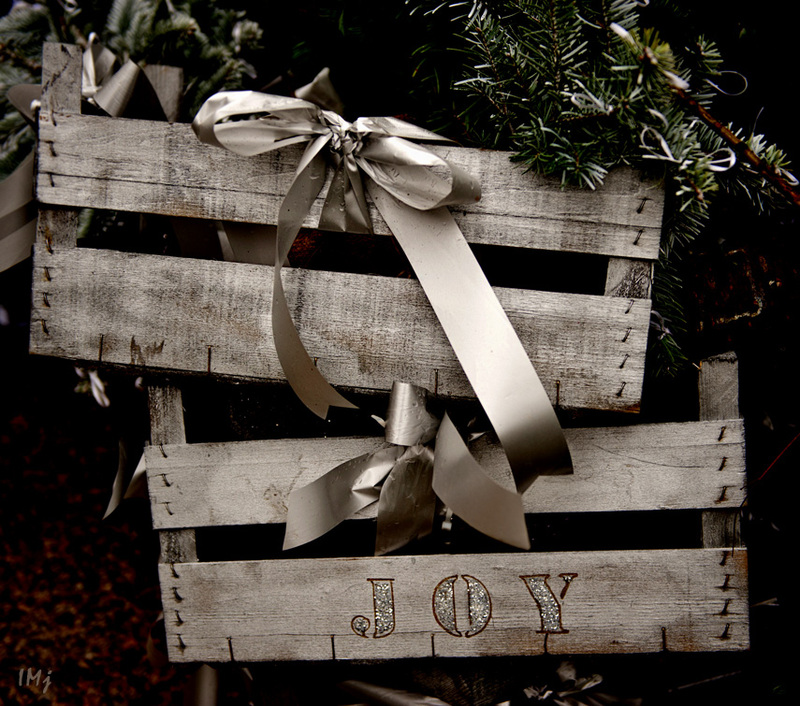 Some thirty decorated Christmas trees were dumped there like no longer worshiped idols. The Holidays are over. 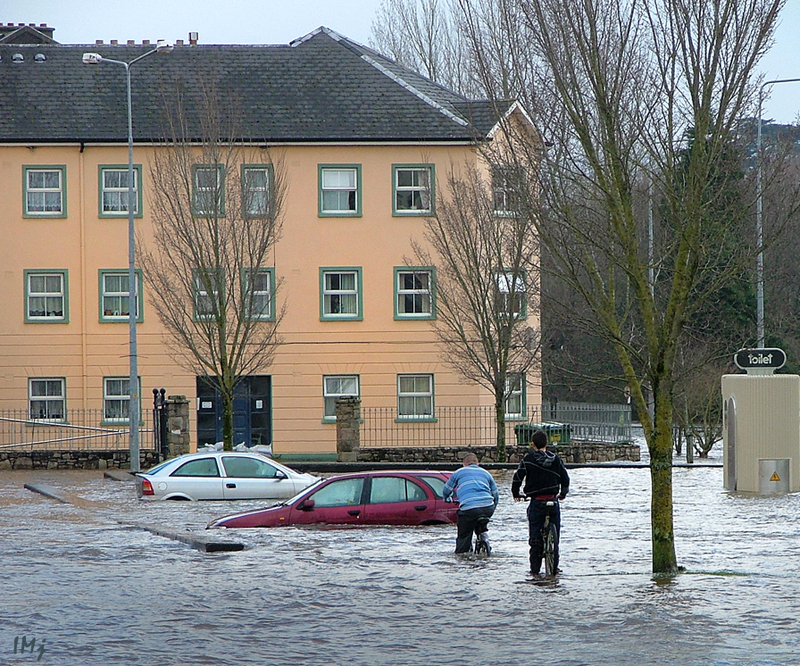 Holiday season in Ireland was darkened by severe and extensive floods that hit the country in the end of December- beginning of January. Property and farmlands are damaged, people are devastated after losing their possessions and security of their homes. I haven’t been to the flooded areas this year, but I have some pictures taken during the flood in 2009 and 2013. 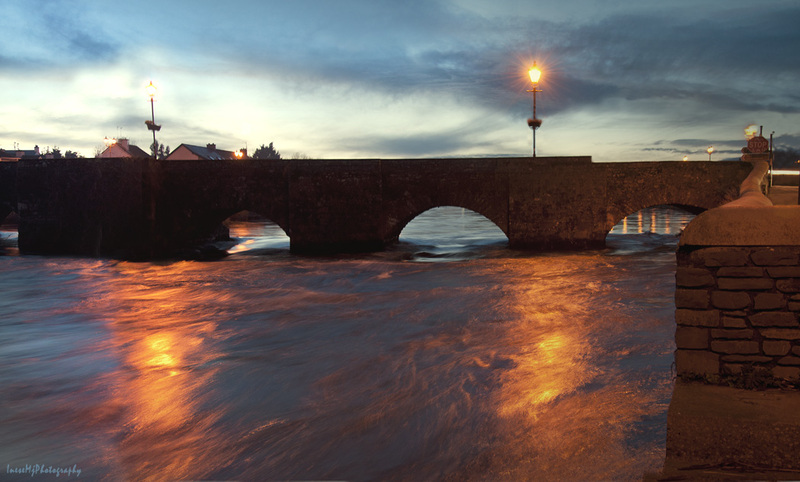 At this stage, River Suir looks fierce and beautiful – Clonmel 2013. 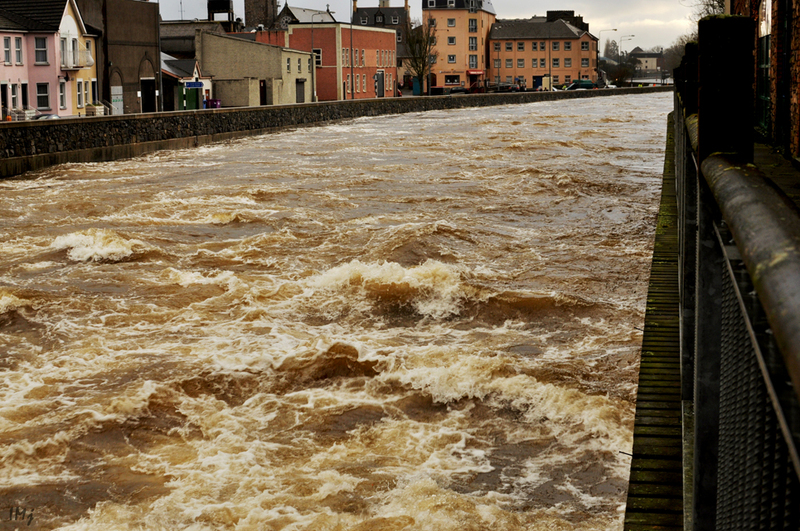 Carrick on Suir in February, at high tide the same year. Unfortunately, there is no fun at all in getting flooded. For many flood victims, this is not the first time they have been flooded in recent years and they face the current crisis without insurance coverage. Murky brown floodwater, sometimes more than a meter deep, causes permanent damage to almost everything. Some farmers have to evacuate their cattle to the neighboring farms. Feed and pastures are destroyed, and it will take months the land to drain and recover its capacity to grow crops. People blame the EU Conservation Program. Floods have always been around, they are natural. Much of the flooding is caused by bad planning, allowing roads and houses to be built on natural flood plains. It seems that unpopular decisions are required, like relocation of businesses and people. Now that the worst seems to be over, it is time to start thinking about the next flood, and take it seriously. On a lighter note – we can also dream 🙂 This sweet girl lives in the place where it is snowing in winter. What is she dreaming of? This lovely girl lives in Ireland. May be she is dreaming of a dry, white winter? ← Look back. Smile back. 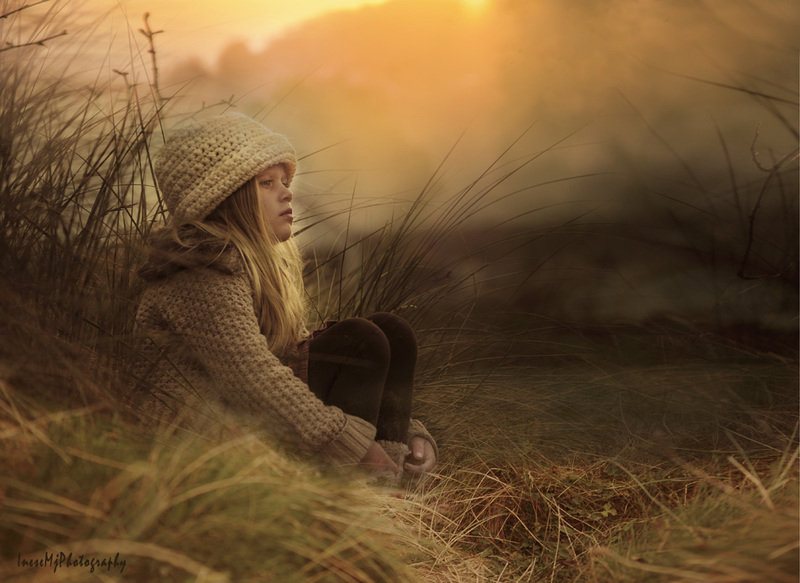 I didn’t know you made these nostalgic and moody portraits of the little girls. They are very nice! I’m sorry for the floods, but you bring hope with these real nice images. Thank you so much Maria! I don’t upload children photographs for public view too often for the safety reasons. whew! That is some terrible flooding, Inese. Everything from tragedies to severe inconvenience in flooding, I hope all is settled for now. Lovely photos. Thank you! Yes, everything cleaned up and dry. Floods can wreak havoc and cause so many families distress. Recovery takes so long, too. The North of England has had similar floods to those in Ireland. And you’re right, humans are to blame for a great deal of the worst flooding. Like you,Inese, I’m hoping that the new year will bring relief and comfort for those in affected areas. Your photos are excellent, and the two little dreamers are beautiful. Floods have been terrible in England as well, and our garage has been flooded but thankfully, our car was not in it when it happened. I hope that too, because it has been a terrible couple of weeks. How sad to hear of this extensive flooding that is damaging farms and homes. I feel for those flood victims. The last two photos are very beautiful. You are a very skilled, soulful photographer. Congrats. Thank you so much for your kind comment, Cynthia! Community members did a great job helping the flooded clean up their homes. Such amazing spirit! What strength these people have! Here in the state of Washington, we have a section of houses, built on a flood plain, that are on stilts. They’re very strange to see but quite necessary. I hope some kind of solution is found there soon! Thank you for stopping by! I hope they finally find solution, because the weather is changing and the floods may rise more frequently in the future. It is interesting, the stilts. I have never seen such houses, have to check out in Google. I feel terribly sorry for people who lose their homes or have their lives severely disrupted. I think you are spot on about one of the main reasons, though. It’s a very short-sighted idea to give planning permission to build on a flood plain. Another problem is removing meanders to increase the speed of navigation since this greatly reduces the carrying capacity of the river. They would better leave the rivers alone, you are right about the planning permissions. People will come and go, but the river will always be there. Some homes are flooded because of the barriers built upstream though. Rivers are tricky things to control. I think any building around them has to be done in consultation with specialists and with more than just an eye on the bottom line. Our rivers are tidal, and the floods are a natural thing. I absolutely agree with you that one cannot just go and build away. For a change, we have managed to escape major flooding in Youghal but outside of the town there are bad areas, with some roads closed. Let’s hope for a drier February. Oh thank’s God! I too hope that this nightmare is finally over. Beautiful pictures as always Inese, the flooding has been devastating this year and it must be heart-breaking for those who’ve had to live with it. You are right, it takes years to recover. I too worry about the world where our little dreamers will live. Hope it is kind to them. Flooding, like you said can have devastating effects. So hope things get better soon. Your photos are as always great though. They never fail to impress me. That first shot is gorgeous and priceless! Well taken! Thank you so much! I took a few more shots of the trees and decorations that time. Seeing the Christmas trees dumped in a huge pile was somewhat surreal. Floods can be very devastating…we recently had one in India (though i was not there). Praying for no floods in Ireland. Thank you! Hope your people are safe now. Water is such a force. Hi Inese. For some reason, this post didn’t come to my email. WordPress seems to have a grudge against me lately. I am sorry to hear about the flooding. In Canada, there are people who build on a flood plain and they regularly get flooded but the government assists them with rebuilding and repairing so they have no real incentive to move. It is an unpopular arrangement among the public. Thank you for stopping by! What I think is that people have to move away from the flood plains and let the river have them. 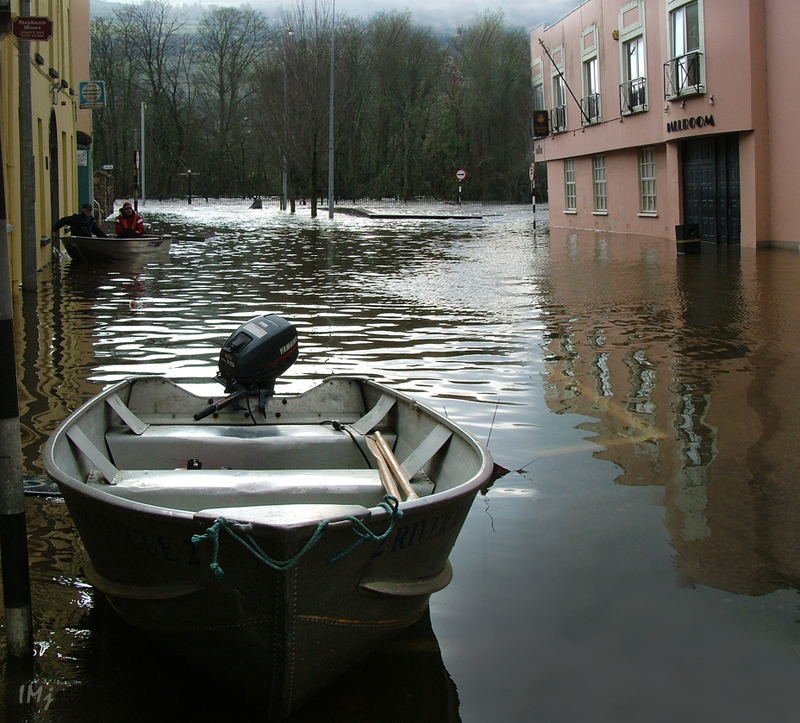 Resisting the natural flooding pattern can cause over-flooding in other places. Thank you! Sorry for the families who had their property damaged in the floods. Stay safe! I agree it’s great to see the community pitching in when these things happen. It’s raining fiercely again this morning so I can only hope you’re not sharing it too. The devastation in Ireland and in the North West of England and in Wales has been terrible. Very often after this the homes won’t be able to find insurance unless the Government step in with some flood defences. I was hoping 2016 might be a better year bit it needs to start improving fast for these poor souls who need their houses drying out before they can move back in. Thank you for stopping by, David! Yes, flood alert is still in place 😦 I have seen some videos from Wales, it is a tragedy, especially now, in the middle of winter. I still have a hope for the beginning of February, Chinese New Year 🙂 I believe in predictions, they are quite correct. Wow – sorry for the horrible flooding in your area. The kayaking video was really interesting, especially where they showed the old flooded churchyard. Hope this is the end of the bad weather for you! Thank you for stopping by and taking a ride 🙂 Suir is a tidal river, and she looks different at different times of the day. In this video the sriver looks quite calm but I have seen some pictures of broken stone walls and trees 😦 We still have flood alert in some places, but the roads are passable at the moment. The US has had some really bad flooding in the last year with loss of lives. Luckily we live on a bluff above a bay so we are safe. Still I cannot imagine the mess that is left behind and many may not have flood insurance. We don’t but we don’t need it. Adorable little girls! Once people are flooded, no insurance will cover them for flood again. Now with the climate change more properties are in danger. Our floods are not as bad as in the US, for many different reasons, and I know only one case when a women drowned in her home a couple of year ago, but it is a tragedy for every one affected. And the mess, you are right, the mess is unbelievable! This is terrible for those affected, and as you say, not the first time. It’s been a miserable few weeks with floods ruining homes and lives in Europe and the US, bush fires in Australia and of course the entirely human tragedies of war and population displacement. Yes, you are absolutely right. Hope for a better year ahead. That looks very severe flooding in Ireland. US has been under the same situation. It is devastating to the victims everywhere. Water can damage any thing. My sympathy go to them. I like the lovely pictures of the girls at the end of the post. Thank you so much for your comment! Yes, water is such a force. You should see this river in summer. Some areas are almost dry, you can walk across stepping on the stones. Oh they are. Devastating and scary. This weekend is dry, the roads are ok, but the fields still swampy. Flooding in the states, too. We’ve not had any, but friends in Illinois and Missouri have been dealing with extensive flooding. My brother’s home in Houston flooded in back to back years. Finally the city took action. It’s a devastating event. Oh it is devastating. The water is such a force, and it is coming up with such a speed, it is scary. The locals in the flooded areas help cleaning up after the flood – it is amazing to see community united in the face of disaster. Sorry to hear about the flooding. We’re having some coastal flooding but so far, not too bad. (knock on wood). I think the little girl is dreaming of a new puppy! That is such awful news and devastating for the people flooded out and losing everything. I can only imagine. We are in a flood zone as well and hopefully it never happens. Be well. Thank you! Some of the people I know have been flooded. People who never experienced flooding have no idea how dirty and stinky is the floodwater. The stinkyness I’ve smelled that but not as extensive as you showed. It I can imagine is more of a mess when the water recedes. Yes, cleaning up after the flood is anything but pleasant. So sad to see the floods coming especially during the winter time – I have been experiencing floods attack in Indonesia and I know it was unpleasant disaster and I just can’t imagine how it must feel when the temparature is also cold. 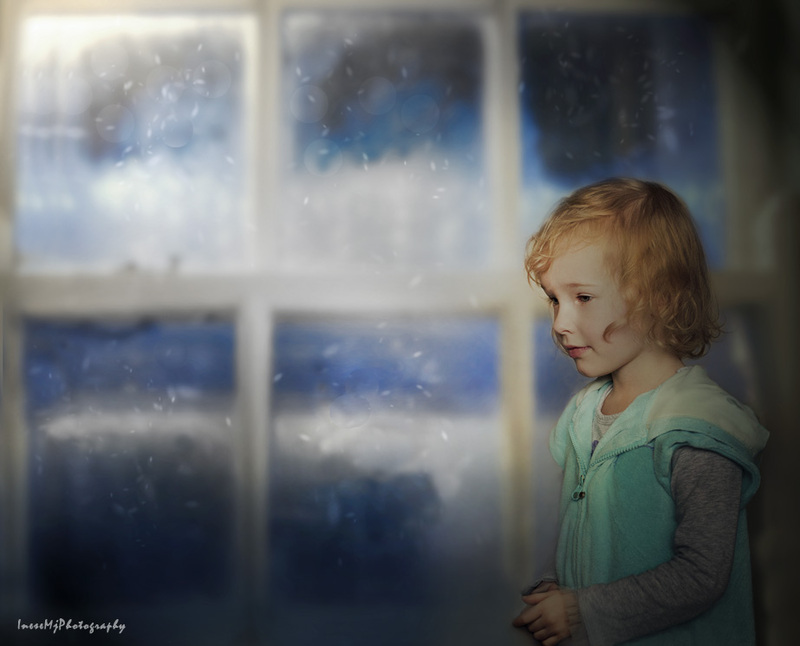 Your images are impressive – love the ones with little girls 😊 great images! Thank you so much Indah! It is devastating to lose everything. So happy you are back to blogging. I will visit your blog very soon 🙂 I want to know how you got settled. Good 🙂 I am very excited for you! I had no idea about this. Thanks for enlightening me. I pray for all the flood victims in Ireland and thanks for sharing your photos. You were somehow able to capture the beauty of nature, even during one of its roughest moments with the floods. Thank you so much for your kind comment! Yes, it is a devastating time, and some of the people I know personally got flooded. Living through a flood is a hardship! It is one thing when it is a normal natural annual occurrence. When it is unnaturally caused by man, it is a sin. Hey, I bet the folks who built the dam or whatever live in a dry place & maybe made profit. Just the cynic in me speaking. That’s good to know! 🙂 BTW … great shots! I’m a bit inclined to agree, Resa…. I’m sorry about the flooding but your photography and the looking forward, was what I meant by beautiful. Inese, how right you are about the seriousness of floods. My hubby had a business in Clonmel that was flooded verrrrrrrrrrrrrrrrry badly over the years, It’s heartbreaking to see the devastation it causes. Thankfully, we are out of that premises now but our thoughts will always be with those who are washed out. I am so sorry for your husband and all of those who have such devastating losses because of the flood. It is hard to recover psychologically, not only economically. Thanks Inese. Glad to say he’s very resilient and Mr.Practicality. He’d need to be! Very beautiful in every way. Thank you so much for your comment, Nicodemas!